I live with slobs…two of them…and three dogs. There was a point in my life when a clean house meant much more to me than a clean house. The thought of someone coming in my home and seeing the truth of our sloppiness would put me in a frenzy. A clean house, scented with lemon and bleach, was the proof that I was good. Good at keeping things organized and pristine. Able to don an apron, whip up a mouth watering home cooked meal, win mother of the year, and be the wife that I thought many of my friends had already achieved with ease. I would spend my entire Saturdays cleaning like a mad woman, scrubbing floors on my hands and knees. Only when fully exhausted, would the satisfaction of a job well done be accepted. My husband on the other hand, could have cared less…except the part about a mouth watering meal. Yes, the way to his heart is through his tummy. Then life got busy…crazy busy. I was in school and working full time. We had two kids in sports. My husband took on a new demanding role at work requiring much more than 40 hours a week…..and life began to fall apart. Or at least the house did. Because my definition of perfection balanced on a clean house, I found myself exhausted and in tears most of the time. Trying something new, I came up with chore lists for the children and my husband… yeah, that was a total fail …They had no desire to achieve the perfection I dreamed about….After one to many days of not feeling up to par, I made a deal with myself. The house would be liveable. Not perfect, not pristine, not white glove….but liveable. I would learn to be okay with it for the sake of my sanity. Ignoring the bad and looking at the good has been one of those life lessons that I wish I would have learned sooner. I’m pleased to report that I’m now just fine with the slobbiness that defines my family, as long as it is livable. There are days that the sink has dishes in it, the floor needs to be vacuumed, and the bathrooms could use a wipe down…and yet, I put my feet up, drink a glass of wine, and enjoy The Real Housewives of New Jersey instead. Why? Because no one in the house seems to care either. It isn’t a priority for them and I’m no longer allowing it to define my role as wife or mother. Ladies, we often paint a picture that only we can see. We work to get our family on board, feeling like failures when we can’t express to them the beauty of the picture. If only they would do this, or that, or anything….can’t they see how much better or easier or prettier it would be?? We let this picture define and shape us, to feed our spirit and our minds….yet it never really does. Cut yourself some slack. Drink the wine, watch t.v., read a book in total peace, with dirty dishes in the sink. There will always be something for you to do around the house…Learn to ignore. 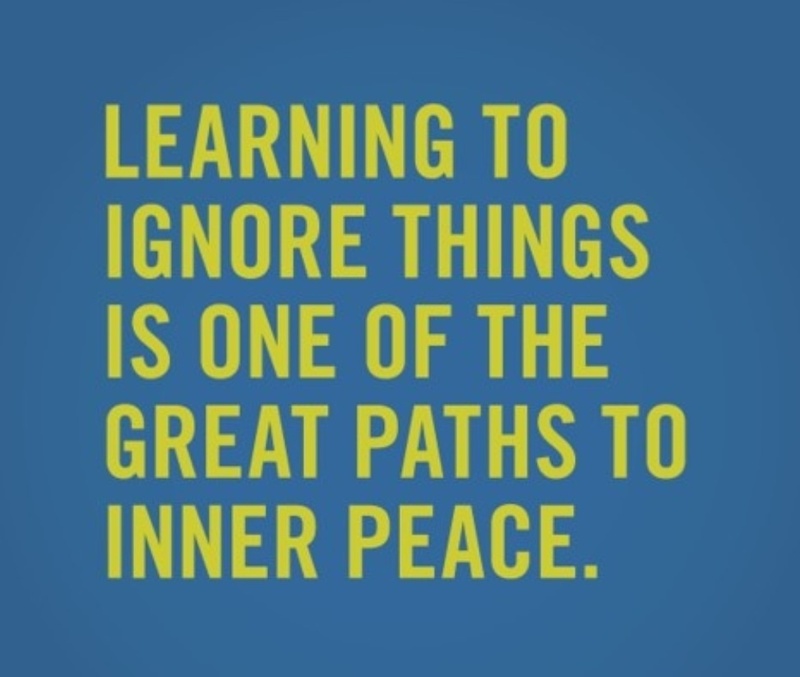 Learning to ignore is one of the great paths to inner peace. I love it! I felt you were sitting next to me. Heather, the part about living with slobs, trying to keep it cleaned, or ignoring?…or ALL of the above?